Tao Huilan (pseudonym), a Buddhist in her 70s who has lived at Zushi Temple, in Huangshi city in central China’s Hubei Province for 16 years, is suddenly without a home. On September 24, 2018, authorities from the local Religious Affairs Bureau and the town government came to the temple to conduct an inspection and, despite showing them all of her proper documentation – of ordination, conversion and the registration for the venue to hold religious activities issued by the county’s Ethnic and Religious Affairs Bureau – they kicked her out of the temple. Her papers, they said, were useless, and the central government’s inspection team was coming in. Never mind, of course, that Tao Huilan had raised two children while managing the burning of the incense at the temple. After ordering her to leave the temple, she was also prohibited from wearing her Buddhist robe. Still, Tao Huilan thought she would be able to move back to the temple after the inspection was over. But then, a month later, eight people – including the town’s government officials and the village Party secretary – arrived at the temple again and ordered two villagers to brick up the temple’s entrance and windows completely. Xiuling Temple was sealed off by the local government. “This policy comes from above. If the temple isn’t sealed up, it will need to be demolished,” a government official told Tao Huilan, who was trying to stop them. Helpless, all Tao Huilan could do was watch as the temple’s main entrance and windows were bricked up. 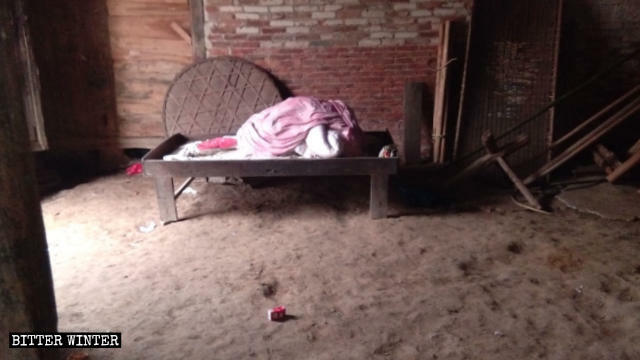 Afterward, government officials ordered her to move her bed and quilt out of the temple through the side door and into a very dilapidated and crude building next door – there were no doors or windows. Worse yet, it was the place where the village’s dead are housed before burial. The shabby house where Tao Huilan lives. On November 6, the director of the village women’s congress – part of the local committee of the Women’s Federation, which carries out the Chinese Communist Party’s orders – warned Tao Huilan that she can’t live at the temple and can’t collect alms. The director also claimed that government personnel would be conducting secret inspections and that as soon as they discover that someone is living in the temple, it will be demolished. The small room where Tao Huilan lives is very crude. Tao Huilan relied on the money donated by the Buddhists and ordinary people who went to burn incense and worship in the temple. After the temple was sealed, life became extremely difficult for Tao Huilan and her two children. 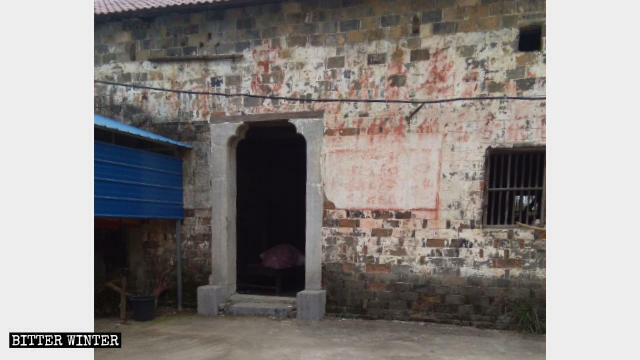 Another temple – Xiuling Temple, located in the Tieshan district of Huangshi city, Hubei Province – was also sealed off, and two female Buddhists in their 60s who lived at the temple were repeatedly evicted. Lingxiu Temple was sealed off by the local government. 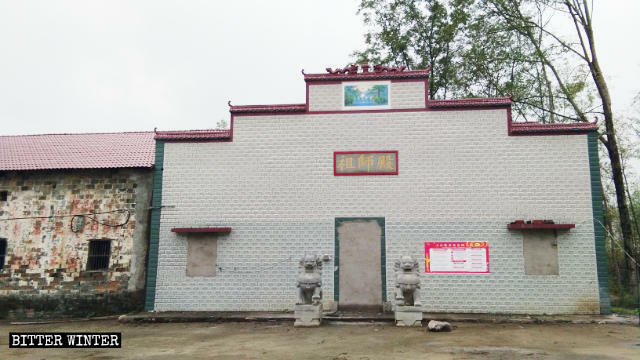 In September 2018, one of the women, who was in charge of the temple, spent more than 20,000 RMB (almost $ 3,000) repairing and renovating the temple. 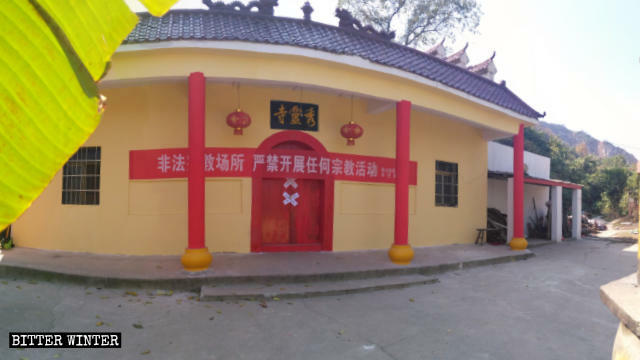 Less than a month later, the local community’s Party secretary, director, and some other officials came to Xiuling Temple and claimed it didn’t have a certificate of registration for the venue of religious activities and must be sealed off. Shortly after that, community personnel sealed off the temple with paper strips and ordered the two women to move out immediately. Since they had nowhere else to go, they secretly stayed at the temple. On October 27, the community director and officials from the United Front Work Department (UFWD) came to the temple again. Upon seeing that the temple’s door was open, a UFWD official chided the accompanying community officials. “When the central inspection team comes to investigate, if they find that there are still people worshiping Buddha in the temple and people living here, the mayor will be demoted by two ranks, and all of the community officials will be fired from their position,” they said. The government officials remained indifferent. They forcibly locked the temple’s door, coerced the two believers into leaving the temple and threatened that the temple would be demolished if the door was opened again. According to sources, to prevent the two believers from returning to live at the temple, the authorities also arranged for the owner of a restaurant near the holy site to monitor the intersection leading up the mountain where the temple is located and prohibit them from returning. According to a Buddhist who is in charge of a temple in Yangxin county under the jurisdiction of Huangshi city, more than 100 temples have been sealed off in that one county alone.